Why do I need a Quox Creek Vortex Fountain? Because you’ll love the sound that it makes. Because it’s a fun decorating idea. Because it’s a conversation piece for your office or living room. Because you like having cool gadgets. Because it doesn’t make a mess the way other fountains do. Because that guy in the cubicle down the hall will be jealous. What are my shipping options when ordering a Quox Creek Vortex Fountain? We provide several shipping options with varying delivery times from two weeks to 2 days. International shipping is also available to many areas. More details here available here. Yes, it’s super easy. Just click on “My Account” in the menu at the top of any page. On that page, you’ll find links to edit your address(es), update your password, check your orders, etc. If you need more extensive help, please use our Contact Page to send us a message describing the issue and we’ll do our best to help resolve it. 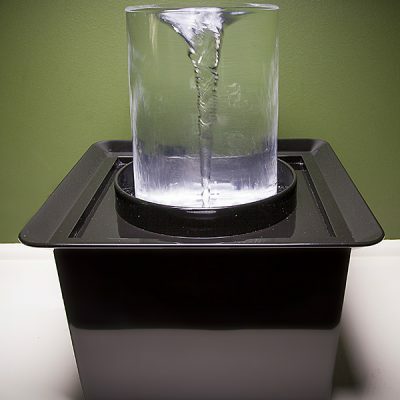 Why shouldn’t I add water to the tabletop Vortex Fountain by pouring it into the vortex chamber? ALWAYS TURN OFF THE FOUNTAIN AND ALLOW THE VORTEX CHAMBER TO DRAIN BEFORE ADDING WATER. (Is that emphatic enough?) While it may seem easier, filling the fountain by pouring water directly into the vortex chamber can lead to overfilling and flooding. We recommend you turn off the fountain, remove the decorative tray while waiting for the vortex chamber to drain, then add water through the outer drain ring into the reservoir until the reservoir is at capacity. Gently replace the decorative tray then turn the fountain back on. Why isn’t water flowing around all sides of the Vortex Fountain’s upper cylinder? Make sure the pump is set to its fully-open position and is moving the maximum amount of water. Make sure the pump, the vortex chamber, and the reservoir are clean and free of debris. Debris can clog the pump and affect its performance. Debris along the edges of the vortex chamber can also affect the flow over the edges. Can I use the Vortex Fountain without the decorative tray? Is the Vortex Fountain safe for birds and animals? In our experience, birds tend to avoid the garden Vortex Fountain because they don’t like the speed of the swirling water and there’s not a comfortable place for them to land on the rim of the fountain. If a healthy bird did happen to drop into the vortex, it wouldn’t have any trouble getting back out; even though the water moves quickly, there’s very little suction. We’ve also heard from someone who wants to use the tabletop Vortex Fountain as a water bowl for his dogs (we think that would be cool… but really, really messy). Absolutely not. DO NOT put fish or other aquatic life in the Vortex Fountain. Ever. How do I keep my Vortex Fountain clean? There are lots of fountain- and pond-cleaning products available that will help keep algae under control. (All fountains, bird baths, ponds, pools, etc. will grow stuff if left untreated. Just like any other fountain, if your Vortex Fountain is in a warm, sunny spot, it’ll grow algae even faster.) We’ve had success with a few drops of FounTec Algaecide every few days. Do not use bleach because it can harm the finishes and the pump parts. When necessary, drain the vortex fountain and clean the cylinder with some mild window cleaner. And, now and then, drain the whole thing, wipe out any gunk that may have accumulated in the reservoir, and give it a wash with some gentle dish soap. Do I have to use distilled water in the Vortex Fountain? You don’t have to use distilled water but you’ll get better results and your fountain will stay fresh longer if you do. The city does a great job of making sure the tap water is clean, clear, and safe for drinking but it still includes minerals and particulates that you can see swirling around in the vortex. Those minerals, over time, can also collect on the fountain’s surfaces as the water evaporates, leaving behind a calcium-white film. Yes, tap water is easier. But, long term, you’ll be happier with distilled water. How big is the tabletop Vortex Fountain? The overall dimensions are 10.5″L x 10.5″W x 13″H. What kind of power does the tabletop Vortex Fountain use? 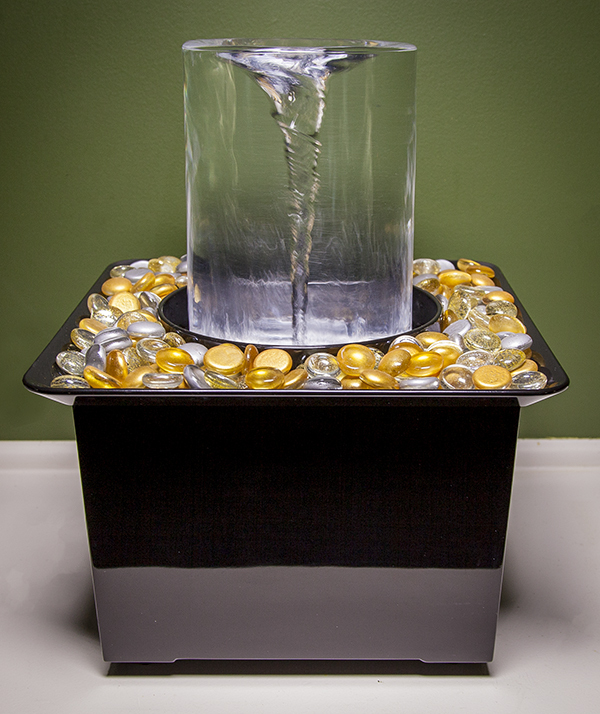 The tabletop Vortex Fountain uses 110V and has a six-foot cord. The plug is US-style. Can the Vortex Fountain be used for other purposes? Well, it’s primary function is as a fountain. 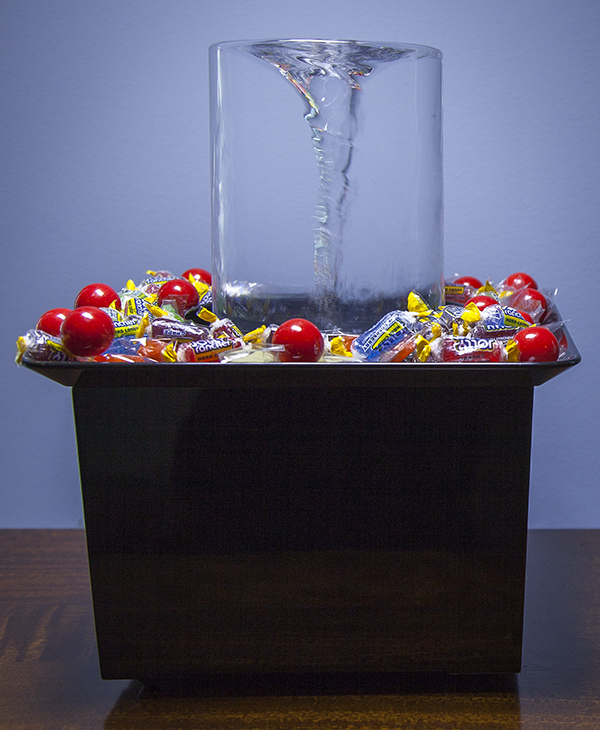 But the Vortex Fountain also makes a fantastic trophy (with a plaque on the side), a great marketing piece (with your logo on the side), a client gift (with your message on the side), even a reception-desk dish for wrapped candies… the possibilities are endless! Well, because it’s fun. Technically, it should probably best be called an “air-core water vortex.” Hmmm. Boring. It’s very similar to a whirlpool or maelstrom but just different enough that it’s not really those either. It looks like a tornado in a jar and we like the idea of having a “pet tornado.” It’s just fun. So lighten up and enjoy. Where can I find DIY instructions for building my own Vortex Fountain? Is a DIY kit available for building a Vortex Fountain? We don’t offer one at the moment. But, if there’s enough interest, we may consider creating one. The Vortex Fountain would be cool in my classroom. Is there an educational-use price? We’re big believers in hands-on, visual tools for education, that’s why we offer a discount for fountains that will be used in classrooms. Students are fascinated by the fountain and it’s a good introduction to weather, fluid dynamics, and lots of math including algebra and geometry. Please contact us with a purchase order from your school. And we’d love to hear how you’re using the Vortex Fountain in your classroom! Here are some of our ideas. Let’s add your creative thoughts to the list! How much water does the Vortex Fountain use? The tabletop Vortex Fountain continually recycles about 1.5 gallons of water. The garden Vortex Fountain can run with five to seven gallons of water but is happier with closer to ten gallons; it also continually recycles the water. You’ll need to top up your fountain now and then to replace the water lost to evaporation. Evaporation rates are dependent on sunlight, humidity, temperature, air movement, etc., e.g. your fountain will need to be topped up more often if it sits on a sunny desk under a strong ceiling fan in a warm office. Do you make a glass version of the Vortex Fountain? Not right now but we hope to in the future. We are searching for an appropriate, quality-conscious supplier to make that happen. Right now, high-quality acrylic is the best way to keep the manufacturing and shipping costs down but we’re hoping to make a glass option available. Stay tuned! Sign up for our newsletter for updates! Where is the Vortex Fountain made? The Vortex Fountain is proudly designed and assembled in the USA using domestic and imported materials. We do as much as possible right here in Central Ohio but we also get help from suppliers from Michigan to Texas to California. The management, assembly, packing, printing, and shipping processes also are based in Columbus, Ohio. Can I get a bunch of desktop Vortex Fountains and put my logo on them? Absolutely. Contact us for bulk rates and marketing ideas! Do you do custom installations of Vortex Fountains? We are focusing on the retail versions right now but we hope to provide custom installations in the future. Stay tuned! 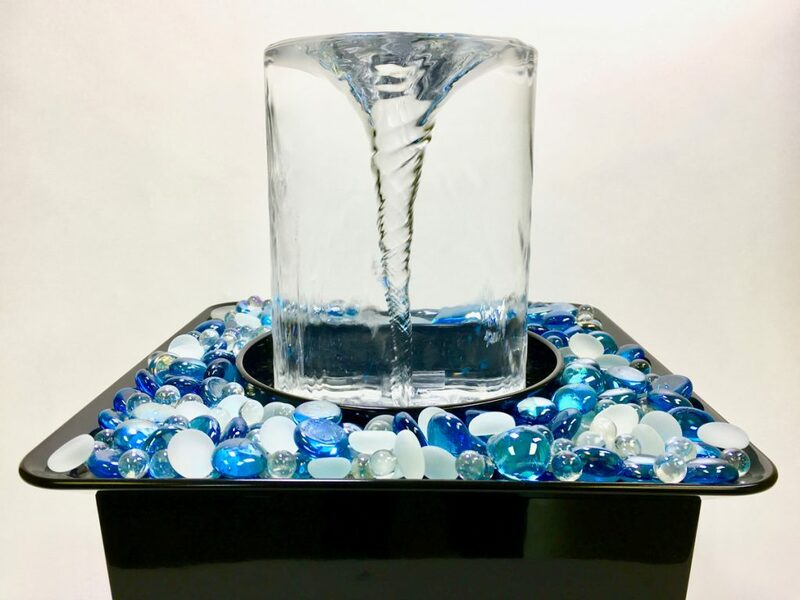 Can I sell the Vortex Fountain in my store or to my clients? We would love for your store or business to join our retail team! Contact us for details on becoming a Quox Creek reseller.